In this episode, Jon, Murph and Chad head back to an old favorite, the Bestiary, to put a little bug in your ears about certain space monster castaways with powers of persuasion. This episode was recorded on February 1, 2018. Thanks very much to Max for audio editing on this episode! Chaosium has released a sheaf of stuff for the Miskatonic Repository called the Miskatonic Collection, which includes forms, images, play aids and documents. They can be used for props in your own Call of Cthulhu games, but these are also meant for creators to used to spice up submissions to the Miskatonic Repository. Forms in the collection from Dean Englehart include Arkham Sanitarium Forms, City of Arkham Forms, Medical Forms, Telegrams, and more. There are also maps by Stephanie Maclea. Skype of Cthulhu posted its first session about 7 years ago. Jim posted some impressive numbers and an infographic to celebrate. 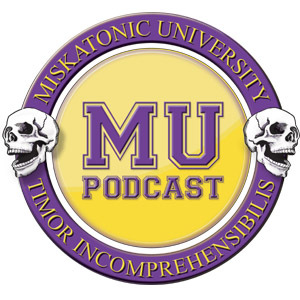 Chad was on Legends of Tabletop with John Haremza and Oscar Rios and Bill Adcock playing Invictus, with a character born during an as-yet un-aired MU Podcast AP with y’all. Horatius the “retired grain inspector” (code for spy in the Second Century Roman empire) joins Iavolenus the bodyguard and Lucius the Centurion on a trek to a remote village in the Alps.